Not to be confused with Diesel (game engine). Diesel engine built by Langen & Wolf under licence, 1898. The Diesel engine has the highest thermal efficiency (engine efficiency) of any practical internal or external combustion engine due to its very high expansion ratio and inherent lean burn which enables heat dissipation by the excess air. A small efficiency loss is also avoided compared with two-stroke non-direct-injection gasoline engines since unburned fuel is not present at valve overlap and therefore no fuel goes directly from the intake/injection to the exhaust. Low-speed Diesel engines (as used in ships and other applications where overall engine weight is relatively unimportant) can reach effective efficiencies of up to 55%. Diesel engines may be designed as either two-stroke or four-stroke cycles. They were originally used as a more efficient replacement for stationary steam engines. Since the 1910s they have been used in submarines and ships. Use in locomotives, trucks, heavy equipment and electricity generation plants followed later. In the 1930s, they slowly began to be used in a few automobiles. Since the 1970s, the use of Diesel engines in larger on-road and off-road vehicles in the US has increased. According to Konrad Reif, the EU average for Diesel cars accounts for 50% of the total newly registered. The world's largest Diesel engines put in service are 14-cylinder, two-stroke watercraft Diesel engines; they produce a peak power of almost 100 MW each. Diesel′s second prototype. It is a modification of the first experimental engine. On 17 February 1894, this engine ran under its own power for the first time. First fully functional Diesel engine, designed by Imanuel Lauster, built from scratch, and finished by October 1896. In 1878, Rudolf Diesel, who was a student at the "Polytechnikum" in Munich, attended the lectures of Carl von Linde. Linde explained that steam engines are capable of converting just 6-10 % of the heat energy into work, but that the Carnot cycle allows conversion of all the heat energy into work by means of isothermal change in condition. According to Diesel, this ignited the idea of creating a machine that could work on the Carnot cycle. After several years of working on his ideas, Diesel published them in 1893 in the essay Theory and Construction of a Rational Heat Motor. "pure atmospheric air is compressed, according to curve 1 2, to such a degree that, before ignition or combustion takes place, the highest pressure of the diagram and the highest temperature are obtained-that is to say, the temperature at which the subsequent combustion has to take place, not the burning or igniting point. To make this more clear, let it be assumed that the subsequent combustion shall take place at a temperature of 700°. Then in that case the initial pressure must be sixty-four atmospheres, or for 800° centigrade the pressure must be ninety atmospheres, and so on. Into the air thus compressed is then gradually introduced from the exterior finely divided fuel, which ignites on introduction, since the air is at a temperature far above the igniting-point of the fuel. The characteristic features of the cycle according to my present invention are therefore, increase of pressure and temperature up to the maximum, not by combustion, but prior to combustion by mechanical compression of air, and there upon the subsequent performance of work without increase of pressure and temperature by gradual combustion during a prescribed part of the stroke determined by the cut-oil". By June 1893, Diesel had realised his original cycle would not work and he adopted the constant pressure cycle. Diesel describes the cycle in his 1895 patent application. Notice that there is no longer a mention of compression temperatures exceeding the temperature of combustion. Now it is simply stated that the compression must be sufficient to trigger ignition. 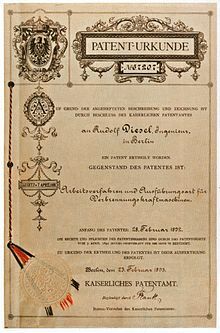 In 1892, Diesel received patents in Germany, Switzerland, the United Kingdom and the United States for "Method of and Apparatus for Converting Heat into Work". In 1894 and 1895, he filed patents and addenda in various countries for his engine; the first patents were issued in Spain (No. 16,654), France (No. 243,531) and Belgium (No. 113,139) in December 1894, and in Germany (No. 86,633) in 1895 and the United States (No. 608,845) in 1898. 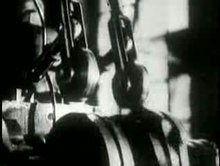 Diesel was attacked and criticised over a time period of several years. Critics have claimed that Diesel never invented a new motor and that the invention of the Diesel engine is fraud. Otto Köhler and Emil Capitaine were two of the most prominent critics of Diesel's time. Köhler had published an essay in 1887 in which he describes an engine similar to the engine Diesel describes in his 1893 essay. Köhler figured that such an engine could not perform any work. 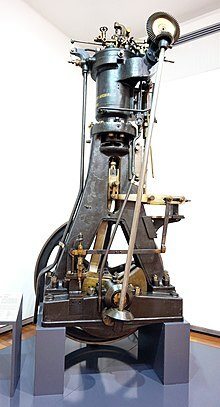 Emil Capitaine had built a petroleum engine with glow-tube ignition in the early 1890s; he claimed against his own better judgement, that his glow-tube ignition engine worked the same way Diesel's engine did. His claims were unfounded and he lost a patent lawsuit against Diesel. 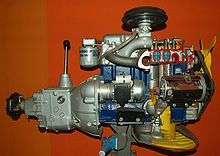 Other engines, such as the Akroyd engine and the Brayton engine, also use an operating cycle that is different from the Diesel engine cycle. Friedrich Sass says that the Diesel engine is Diesel's "very own work" and that any "Diesel myth" is "falsification of history". Diesel sought out firms and factories that would build his engine. With the help of Moritz Schröter and Max Friedrich Gutermuth, he succeeded in convincing both Krupp in Essen and the Maschinenfabrik Augsburg. Contracts were signed in April 1893, and in early summer 1893, Diesel's first prototype engine was built in Augsburg. On 10 August 1893, the first ignition took place, the fuel used was petrol. In winter 1893/1894, Diesel redesigned the engine, which had resulted in the second prototype. On February 17, 1894, the redesigned engine ran for 88 revolutions - one minute; with this news, Maschinefabrik Augsburg's stock rose by 30%, indicative of the tremendous anticipated demands for a more efficient engine. On 26 June 1895 the engine achieved an effective efficiency of 16.6 % and had a fuel consumption of 519 g·kW−1·h−1. However, despite proving the concept, the engine caused problems, and Diesel could not achieve any substantial progress. Therefore, Krupp considered rescission of the contract they had made with Diesel. Diesel was forced to improve the design of his engine and rushed to construct a third prototype engine. Between 8 November and 20 December 1895, the second prototype had successfully covered over 111 hours on the test bench. In the January 1896 report, this was considered a success. In February 1896, Diesel considered supercharging the third prototype. Imanuel Lauster, who was ordered to draw the third prototype, had finished the drawings by 30 April 1896. During summer that year the engine was built, it was completed on 6 October 1896. Tests were conducted until early 1897. First public tests began on 1 February 1897. Moritz Schröter's test on 17 February 1897 was the main test of Diesel's engine. The engine was rated 13.1 kW with a specific fuel consumption of 324 g·kW−1·h−1, resulting in an effective efficiency of 26.2 %. By 1898, Diesel had become a millionaire. 1893: Rudolf Diesel's essay titled Theory and Construction of a Rational Heat Motor appears. 1893: February 21, Diesel and the Maschinenfabrik Augsburg sign a contract that allows Diesel to build a prototype engine. 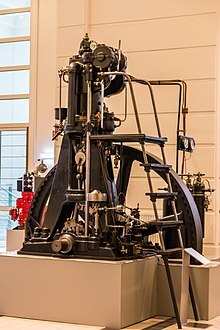 1893: February 23, Diesel obtains a patent (RP 67207) titled "Arbeitsverfahren und Ausführungsart für Verbrennungsmaschinen" (Working Methods and Techniques for Internal Combustion Engines). 1893: April 10, Diesel and Krupp sign a contract that allows Diesel to build a prototype engine. 1893: April 24, both Krupp and the Maschinenfabrik Augsburg decide to collaborate and build just a single prototype in Augsburg. 1893: July, the first prototype is completed. 1893: August 10, Diesel injects fuel (petrol) for the first time, resulting in combustion, destroying the indicator. 1893: November, Diesel applies for a patent (RP 82168) for a modified combustion process. 1894: January 18, after the first prototype had been modified to become the second prototype, testing with the second prototype begins. 1894: February 17, The second prototype runs for the first time. 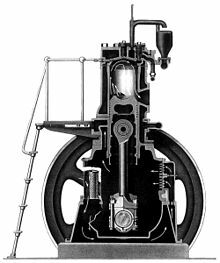 1895: March 30, Diesel applies for a patent (RP 86633) for a starting process with compressed air. 1895: June 26, the second prototype passes brake testing for the first time. 1895: November 8 – December 20, a series of tests with the second prototype is conducted. In total, 111 operating hours are recorded. 1896: October 6, the third and final prototype engine is completed. 1897: October 9, Adolphus Busch licenses rights to the Diesel engine for the US and Canada. 1897: February 1, after 4 years Diesel's prototype engine is running and finally ready for efficiency testing and production. 1897: 29 October, Rudolf Diesel obtains a patent (DRP 95680) on supercharging the Diesel engine. 1898: February 1, the Diesel Motoren-Fabrik Actien-Gesellschaft is registered. 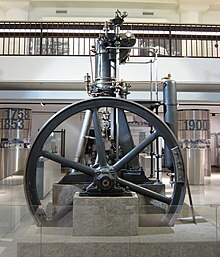 1898: March, the first commercial Diesel engine, rated 2×30 PS (2×22 kW), is installed in the Kempten plant of the Vereinigte Zündholzfabriken A.G.
1898: September 17, the Allgemeine Gesellschaft für Dieselmotoren A.-G. is founded. 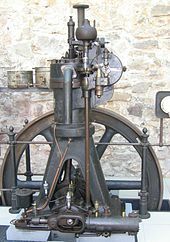 1899: The first two-stroke Diesel engine, invented by Hugo Güldner, is built. An MAN DM trunk piston Diesel engine built in 1906. The MAN DM series is considered to be one of the first commercially successful Diesel engines. 1901: Imanuel Lauster designs the first trunk piston Diesel engine (DM 70). 1901: Until 1901, MAN produces 77 Diesel engine cylinders for commercial use. 1903: Two first Diesel-powered ships are launched, both for river and canal operations: The Vandal naphtha tanker and the Sarmat. 1904: The French launch the first Diesel submarine, the Aigrette. 1905: January 14: Diesel applies for a patent on unit injection (L20510I/46a). 1905: The first Diesel engine turbochargers and intercoolers are manufactured by Büchi. 1906: The Diesel Motoren-Fabrik Actien-Gesellschaft is dissolved. 1908: The first lorry (truck) with a Diesel engine appears. 1909: March 14, Prosper L'Orange applies for a patent on precombustion chamber injection. He later builds the first Diesel engine with this system. 1910: MAN starts making two-stroke Diesel engines. 1910: November 26, James McKechnie applies for a patent on unit injection. Unlike Diesel, he managed to successfully build working unit injectors. 1911: November 27, the Allgemeine Gesellschaft für Dieselmotoren A.-G. is dissolved. 1911: The Germania shipyard in Kiel builds 850 PS (625 kW) Diesel engines for German submarines. These engines are installed in 1914. 1912: MAN builds the first double-acting piston two-stroke Diesel engine. 1912: The first locomotive with a Diesel engine is used on the Swiss Winterthur-Romanshorn railroad. 1912: The Selandia is the first ocean-going ship with Diesel engines. 1913: NELSECO Diesels are installed on commercial ships and US Navy submarines. 1913: September 29, Rudolf Diesel dies mysteriously when crossing the English Channel on the SS Dresden. 1914: MAN builds 900 PS (662 kW) two-stroke engines for Dutch submarines. 1919: Prosper L'Orange obtains a patent on a Precombustion chamber insert incorporating a needle injection nozzle. First Diesel engine from Cummins. 1923: December 15, the first lorry with a direct-injected Diesel engine is tested by MAN. The same year, Benz builds a lorry with a pre-combustion chamber injected Diesel engine. 1923: The first two-stroke Diesel engine with counterflow scavenging appears. 1924: Fairbanks-Morse introduces the two-stroke Y-VA (later renamed to Model 32). 1925: Sendling starts mass-producing a Diesel-powered agricultural tractor. 1927: Bosch introduces the first inline injection pump for motor vehicle Diesel engines. 1929: The first passenger car with a Diesel engine appears. Its engine is an Otto engine modified to use the Diesel principle and Bosch's injection pump. Several other Diesel car prototypes follow. 1933: Junkers Motorenwerke in Germany start production of the most successful mass-produced aviation Diesel engine of all time, the Jumo 205. By the outbreak of World War II, over 900 examples are produced. Its rated take-off power is 645 kW. 1933: General Motors uses its new roots-blown, unit-injected two-stroke Winton 201A Diesel engine to power its automotive assembly exhibit at the Chicago World's Fair (A Century of Progress). The engine is offered in several versions ranging from 600–900 hp (447–671 kW). 1934: The Budd Company builds the first Diesel-electric passenger train in the US, the Pioneer Zephyr 9900, using a Winton engine. 1935: The Citroën Rosalie is fitted with an early swirl chamber injected Diesel engine for testing purposes. Daimler-Benz starts manufacturing the Mercedes-Benz OM 138, the first mass-produced Diesel engine for passenger cars, and one of the few marketable passenger car Diesel engines of its time. It is rated 45 PS (33 kW). 1936: March 4, the airship LZ 129 Hindenburg, the biggest aircraft ever made, takes off for the first time. She is powered by four V16 Daimler-Benz LOF 6 Diesel engines, rated 1200 PS (883 kW) each. 1936: Manufacture of the first mass-produced passenger car with a Diesel engine (Mercedes-Benz 260 D) begins. 1937: Konstantin Fyodorovich Chelpan develops the V-2 Diesel engine, later used in the Soviet T-34 tanks, widely regarded as the best tank chassis of World War II. 1938: General Motors forms the GM Diesel Division, later to become Detroit Diesel, and introduces the Series 71 inline high-speed medium-horsepower two stroke engine, suitable for road vehicles and marine use. 1946: Klöckner-Humboldt-Deutz (KHD) introduces an air-cooled mass-production Diesel engine to the market. 1950s: KHD becomes the air-cooled Diesel engine global market leader. 1951: J. Siegfried Meurer obtains a patent on the M-System, a design that incorporates a central sphere combustion chamber in the piston (DBP 865683). 1953: First mass-produced swirl chamber injected passenger car Diesel engine (Borgward/Fiat). 1954: Daimler-Benz introduces the Mercedes-Benz OM 312 A, a 4.6 litre straight-6 series-production industrial Diesel engine with a turbocharger, rated 115 PS (85 kW). It proves to be unreliable. 1954: Volvo produces a small batch series of 200 units of a turbocharged version of the TD 96 engine. This 9.6 litre engine is rated 136 kW. 1955: Turbocharging for MAN two-stroke marine Diesel engines becomes standard. 1959: The Peugeot 403 becomes the first mass-produced passenger sedan/saloon manufactured outside West Germany to be offered with a diesel engine option. Mercedes-Benz OM 352, one of the first direct injected Mercedes-Benz Diesel engines. It was introduced in 1963, but mass production only started in summer 1964. 1964: Summer, Daimler-Benz switches from precombustion chamber injection to helix-controlled direct injection. 1962–65: A Diesel compression braking system, eventually to be manufactured by the Jacobs Manufacturing Company and nicknamed the "Jake Brake", is invented and patented by Clessie Cummins. 1972: KHD introduces the AD-System, Allstoff-Direkteinspritzung, (anyfuel direct-injection), for its Diesel engines. AD-Diesels can operate on virtually any kind of liquid fuel, but they are fitted with an auxiliary spark plug that fires if the ignition quality of the fuel is too low. 1976: Development of the common rail injection begins at the ETH Zürich. 1976: The Volkswagen Golf becomes the first compact passenger sedan/saloon to be offered with a diesel engine option. 1978: Daimler-Benz produces the first passenger car Diesel engine with a turbocharger (Mercedes-Benz OM 617). 1979: First prototype of a low-speed two-stroke crosshead engine with common rail injection. 1981/82: Uniflow scavenging for two-stroke marine Diesel engines becomes standard. 1985: December, road testing of a common rail injection system for lorries using a modified 6VD 12,5/12 GRF-E engine in an IFA W50. 1986: BMW E28 524td, the world's first passenger car equipped with an electronically controlled injection pump (developed by Bosch). 1987: Daimler-Benz introduces the electronically controlled injection pump for lorry Diesel engines. 1988: The Fiat Croma becomes the first mass-produced passenger car in the world to have a direct injected Diesel engine. 1989: Audi 100, the first passenger car in the world with a turbocharged, direct injected, and electronically controlled Diesel engine. 1992: 1 July, the Euro 1 emission standard comes into effect. 1993: First passenger car Diesel engine with four valves per cylinder, the Mercedes-Benz OM 604. 1994: Unit injector system by Bosch for lorry Diesel engines. 1996: First Diesel engine with direct injection and four valves per cylinder, used in the Opel Vectra. 1996: First radial piston distributor injection pump by Bosch. 1997: First mass-produced common rail Diesel engine for a passenger car, the Fiat 1.9 JTD. 1998: BMW wins the 24 Hours Nürburgring race with a modified BMW E36. The car, called 320d, is powered by a 2-litre, straight-four Diesel engine with direct injection and a helix-controlled distributor injection pump (Bosch VP 44), producing 180 kW. The fuel consumption is 23 l/100 km, only half the fuel consumption of a similar Otto-powered car. 1998: Volkswagen introduces the VW EA188 Pumpe-Düse engine (1.9 TDI), with Bosch-developed electronically controlled unit injectors. 1999: Daimler-Chrysler presents the first common rail three-cylinder Diesel engine used in a passenger car (the Smart City Coupé). Audi R10 TDI, 2006 24 Hours of Le Mans winner. 2000: Peugeot introduces the Diesel particulate filter for passenger cars. 2002: Piezoelectric injector technology by Siemens. 2003: Piezoelectric injector technology by Bosch, and Delphi. 2004: BMW introduces dual-stage turbocharging with the BMW M57 engine. 2006: The world's most powerful Diesel engine, the Wärtsilä RT-flex96C, is produced. It is rated 80,080 kW. 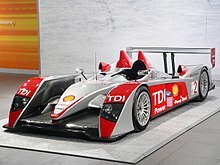 2006: Audi R10 TDI, equipped with a 5.5-litre V12-TDI engine, rated 476 kW, wins the 2006 24 Hours of Le Mans. 2006: Daimler-Chrysler launches the first series-production passenger car engine with selective catalytic reduction exhaust gas treatment, the Mercedes-Benz OM 642. It is fully complying with the Tier2Bin8 emission standard. 2008: Volkswagen introduces the LNT catalyst for passenger car Diesel engines with the VW 2.0 TDI engine. 2008: Volkswagen starts series production of the biggest passenger car Diesel engine, the Audi 6-litre V12 TDI. 2008: Subaru introduces the first horizontally opposed Diesel engine to be fitted to a passenger car. It is a 2-litre common rail engine, rated 110 kW. 2010: Mitsubishi developed and started mass production of its 4N13 1.8 L DOHC I4, the world's first passenger car Diesel engine that features a variable valve timing system. 2012: BMW introduces dual-stage turbocharging with three turbochargers for the BMW N57 engine. 2015: Common rail systems working with pressures of 2,500 bar launched. 2015: In the Volkswagen emissions scandal, the US EPA issued a notice of violation of the Clean Air Act to Volkswagen Group after it was found that Volkswagen had intentionally programmed turbocharged direct injection (TDI) Diesel engines to activate certain emissions controls only during laboratory emissions testing. Compression ignition: Due to almost adiabatic compression, the fuel ignites without any ignition-initiating apparatus such as spark plugs. Mixture formation inside the combustion chamber: Air and fuel are mixed in the combustion chamber and not in the inlet manifold. Engine speed adjustment solely by mixture quality: Instead of throttling the air-fuel mixture, the amount of torque produced (resulting in crankshaft rotational speed differences) is set solely by the mass of injected fuel, always mixed with as much air as possible. Heterogeneous air-fuel mixture: The dispersion of air and fuel in the combustion chamber is uneven. Diffusion flame: At combustion, oxygen first has to defuse into the flame, rather than having oxygen and fuel already mixed before combustion, which would result in a premixed flame. Fuel with high ignition performance: As Diesel engines solely rely on compression ignition, fuel with high ignition performance (cetane rating) is ideal for proper engine operation, fuel with a good knocking resistance (octane rating), e.g. petrol, is suboptimal for Diesel engines. p-V Diagram for the Ideal Diesel cycle. The cycle follows the numbers 1–4 in clockwise direction. The horizontal axis is Volume of the cylinder. In the Diesel cycle the combustion occurs at almost constant pressure. On this diagram the work that is generated for each cycle corresponds to the area within the loop. The Diesel internal combustion engine differs from the gasoline powered Otto cycle by using highly compressed hot air to ignite the fuel rather than using a spark plug (compression ignition rather than spark ignition). In the Diesel engine, only air is initially introduced into the combustion chamber. The air is then compressed with a compression ratio typically between 15:1 and 23:1. This high compression causes the temperature of the air to rise. At about the top of the compression stroke, fuel is injected directly into the compressed air in the combustion chamber. This may be into a (typically toroidal) void in the top of the piston or a pre-chamber depending upon the design of the engine. The fuel injector ensures that the fuel is broken down into small droplets, and that the fuel is distributed evenly. The heat of the compressed air vaporises fuel from the surface of the droplets. The vapour is then ignited by the heat from the compressed air in the combustion chamber, the droplets continue to vaporise from their surfaces and burn, getting smaller, until all the fuel in the droplets has been burnt. 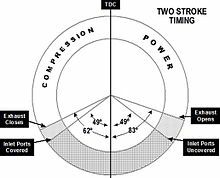 Combustion occurs at a substantially constant pressure during the initial part of the power stroke. The start of vaporisation causes a delay before ignition and the characteristic Diesel knocking sound as the vapour reaches ignition temperature and causes an abrupt increase in pressure above the piston (not shown on the P-V indicator diagram). When combustion is complete the combustion gases expand as the piston descends further; the high pressure in the cylinder drives the piston downward, supplying power to the crankshaft. As well as the high level of compression allowing combustion to take place without a separate ignition system, a high compression ratio greatly increases the engine's efficiency. Increasing the compression ratio in a spark-ignition engine where fuel and air are mixed before entry to the cylinder is limited by the need to prevent damaging pre-ignition. Since only air is compressed in a Diesel engine, and fuel is not introduced into the cylinder until shortly before top dead centre (TDC), premature detonation is not a problem and compression ratios are much higher. The p–V diagram is a simplified and idealised representation of the events involved in a Diesel engine cycle, arranged to illustrate the similarity with a Carnot cycle. 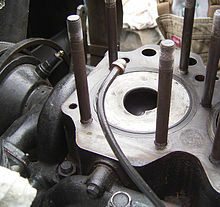 Starting at 1, the piston is at bottom dead centre and both valves are closed at the start of the compression stroke; the cylinder contains air at atmospheric pressure. Between 1 and 2 the air is compressed adiabatically—that is without heat transfer to or from the environment—by the rising piston. (This is only approximately true since there will be some heat exchange with the cylinder walls.) During this compression, the volume is reduced, the pressure and temperature both rise. At or slightly before 2 (TDC) fuel is injected and burns in the compressed hot air. Chemical energy is released and this constitutes an injection of thermal energy (heat) into the compressed gas. Combustion and heating occur between 2 and 3. In this interval the pressure remains constant since the piston descends, and the volume increases; the temperature rises as a consequence of the energy of combustion. At 3 fuel injection and combustion are complete, and the cylinder contains gas at a higher temperature than at 2. Between 3 and 4 this hot gas expands, again approximately adiabatically. Work is done on the system to which the engine is connected. During this expansion phase the volume of the gas rises, and its temperature and pressure both fall. At 4 the exhaust valve opens, and the pressure falls abruptly to atmospheric (approximately). This is unresisted expansion and no useful work is done by it. Ideally the adiabatic expansion should continue, extending the line 3–4 to the right until the pressure falls to that of the surrounding air, but the loss of efficiency caused by this unresisted expansion is justified by the practical difficulties involved in recovering it (the engine would have to be much larger). After the opening of the exhaust valve, the exhaust stroke follows, but this (and the following induction stroke) are not shown on the diagram. If shown, they would be represented by a low-pressure loop at the bottom of the diagram. At 1 it is assumed that the exhaust and induction strokes have been completed, and the cylinder is again filled with air. The piston-cylinder system absorbs energy between 1 and 2—this is the work needed to compress the air in the cylinder, and is provided by mechanical kinetic energy stored in the flywheel of the engine. Work output is done by the piston-cylinder combination between 2 and 4. 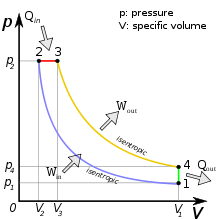 The difference between these two increments of work is the indicated work output per cycle, and is represented by the area enclosed by the p–V loop. The adiabatic expansion is in a higher pressure range than that of the compression because the gas in the cylinder is hotter during expansion than during compression. It is for this reason that the loop has a finite area, and the net output of work during a cycle is positive. Due to its high compression ratio, the Diesel engine has a high efficiency, and the lack of a throttle valve means that the charge-exchange losses are fairly low, resulting in a low specific fuel consumption, especially in medium and low load situations. This makes the Diesel engine very economical. Even though Diesel engines have a theoretical efficiency of 75%, in practice it is much lower. In his 1893 essay Theory and Construction of a Rational Heat Motor, Rudolf Diesel describes that the effective efficiency of the Diesel engine would be in between 43.2 % and 50.4 %, or maybe even greater. Modern passenger car Diesel engines may have an effective efficiency of up to 43 %, whilst engines in large Diesel trucks, and buses can achieve peak efficiencies around 45%. However, average efficiency over a driving cycle is lower than peak efficiency. For example, it might be 37% for an engine with a peak efficiency of 44%. The highest Diesel engine efficiency of up to 55 % is achieved by large two-stroke watercraft Diesel engines. The Diesel engine has the highest effective efficiency of all combustion engines. Diesel engines inject the fuel directly into the combustion chamber, have no intake air restrictions apart from air filters and intake plumbing and have no intake manifold vacuum to add parasitic load and pumping losses resulting from the pistons being pulled downward against intake system vacuum. Cylinder filling with atmospheric air is aided and volumetric efficiency is increased for the same reason. Although the fuel efficiency (mass burned per energy produced) of a Diesel engine drops at lower loads, it doesn't drop quite as fast as that of a typical petrol or turbine engine. Biodiesel is an easily synthesised, non-petroleum-based fuel (through transesterification) which can run directly in many Diesel engines, while gasoline engines either need adaptation to run synthetic fuels or else use them as an additive to gasoline (e.g., ethanol added to gasohol). Diesel engines have a very good exhaust-emission behaviour. The exhaust contains minimal amounts of carbon monoxide and hydrocarbons. Direct injected Diesel engines emit approximately as much nitrogen oxide as Otto cycle engines. Swirl chamber and precombustion chamber injected engines, however, emit approximately 50 % less nitrogen oxide than Otto cycle engines when running under full load. Compared with Otto cycle engines, Diesel engines emit 10 times less pollutants and 3 times less carbon dioxide. Diesel engines can accept super- or turbocharging pressure without any natural limit, constrained only by the design and operating limits of engine components, such as pressure, speed and load. This is unlike petrol engines, which inevitably suffer detonation at higher pressure if engine tuning and/or fuel octane adjustments are not made to compensate. Air blast, where the fuel is blown into the cylinder by a blast of air. Solid fuel / hydraulic injection, where the fuel is pushed through a spring loaded valve / injector to produce a combustible mist. Mechanical unit injector, where the injector is directly operated by a cam and fuel quantity is controlled by a rack or lever. Mechanical electronic unit injector, where the injector is operated by a cam and fuel quantity is controlled electronically. Common rail mechanical injection, where fuel is at high pressure in a common rail and controlled by mechanical means. Common rail electronic injection, where fuel is at high pressure in a common rail and controlled electronically.
. Unlike Otto-cycle engines, incoming air is not throttled. Mechanically governed fuel injection systems are driven by the engine's gear train. These systems use a combination of springs and weights to control fuel delivery relative to both load and speed. Modern electronically controlled Diesel engines control fuel delivery by use of an electronic control module (ECM) or electronic control unit (ECU). The ECM/ECU receives an engine speed signal, as well as other operating parameters such as intake manifold pressure and fuel temperature, from a sensor and controls the amount of fuel and start of injection timing through actuators to maximise power and efficiency and minimise emissions. Controlling the timing of the start of injection of fuel into the cylinder is a key to minimizing emissions, and maximizing fuel economy (efficiency), of the engine. The timing is measured in degrees of crank angle of the piston before top dead centre. For example, if the ECM/ECU initiates fuel injection when the piston is 10° before TDC, the start of injection, or timing, is said to be 10° before TDC. Optimal timing will depend on the engine design as well as its speed and load. 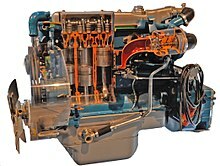 Typical early 20th century air-blast injected Diesel engine, rated at 59 kW. Diesel's original engine injected fuel with the assistance of compressed air, which atomised the fuel and forced it into the engine through a nozzle (a similar principle to an aerosol spray). The nozzle opening was closed by a pin valve lifted by the camshaft to initiate the fuel injection before top dead centre (TDC). This is called an air-blast injection. Driving the compressor used some power but the efficiency was better than the efficiency of any other combustion engine at that time. Also, air-blast injection made engines very clunky and heavy and did not allow for quick load alteration, thus rendering it unusable for road vehicles. An indirect Diesel injection system (IDI) engine delivers fuel into a small chamber called a swirl chamber, precombustion chamber, pre chamber or ante-chamber, which is connected to the cylinder by a narrow air passage. Generally the goal of the pre chamber is to create increased turbulence for better air / fuel mixing. This system also allows for a smoother, quieter running engine, and because fuel mixing is assisted by turbulence, injector pressures can be lower. Most IDI systems use a single orifice injector. The pre-chamber has the disadvantage of lowering efficiency due to increased heat loss to the engine's cooling system, restricting the combustion burn, thus reducing the efficiency by 5–10%.. IDI engines are also more difficult to start and usually require the use of glow plugs. IDI engines may be cheaper to build but generally require a higher compression ratio than the DI counterpart. IDI also makes it easier to produce smooth, quieter running engines with a simple mechanical injection system since exact injection timing is not as critical. Most modern automotive engines are DI which have the benefits of greater efficiency and easier starting; however, IDI engines can still be found in the many ATV and small Diesel applications. Indirect injected Diesel engines use pintle-type fuel injectiors. Direct injection Diesel engines inject fuel directly into the cylinder. Usually there is a combustion cup in the top of the piston where the fuel is sprayed. Many different methods of injection can be used. Usually, an engine with helix-controlled mechanic direct injection has either an inline or a distributor injection pump. For each engine cylinder, the corresponding plunger in the fuel pump measures out the correct amount of fuel and determines the timing of each injection. These engines use injectors that are very precise spring-loaded valves that open and close at a specific fuel pressure. Separate high-pressure fuel lines connect the fuel pump with each cylinder. Fuel volume for each single combustion is controlled by a slanted groove in the plunger which rotates only a few degrees releasing the pressure and is controlled by a mechanical governor, consisting of weights rotating at engine speed constrained by springs and a lever. The injectors are held open by the fuel pressure. On high-speed engines the plunger pumps are together in one unit. The length of fuel lines from the pump to each injector is normally the same for each cylinder in order to obtain the same pressure delay. Direct injected Diesel engines usually use orifice-type fuel injectors. Electronic control of the fuel injection transformed the direct injection engine by allowing much greater control over the combustion. Unit direct injection, also known as Pumpe-Düse (pump-nozzle), is a high pressure fuel injection system that injects fuel directly into the cylinder of the engine. In this system the injector and the pump are combined into one unit positioned over each cylinder controlled by the camshaft. Each cylinder has its own unit eliminating the high-pressure fuel lines, achieving a more consistent injection. Under full load, the injection pressure can reach up to 220 MPa. Unit injection systems used to dominate the commercial Diesel engine market, but due to higher requirements of the flexibility of the injection system, they have been rendered obsolete by the more advanced common-rail-system. Common rail (CR) direct injection systems, unlike other injection systems, do not have a combined pressure creation and injection apparatus. A high-pressure injection pump creates a constant pressure, not depending on the engine speed or fuel mass injected. A buffer, the so-called rail, saves this pressure. This allows fuel injection at any given moment, even multiple injections in a very short amount of time. The Electronic Diesel Control unit (EDC) controls both rail pressure and injections depending on several different parameters of the engine. The injectors of older CR systems have solenoid-driven plungers for lifting the injection needle, whilst newer CR injectors use plungers driven by piezoelectric actuators, that have fewer moving mass and therefore allow even more injections in a very short period of time. The injection pressure of modern CR systems ranges from 140 MPa to 270 MPa. Regular cylinder configurations such as straight (inline), V, and boxer (flat) configurations can be used for Diesel engines. The inline-six-cylinder design is the most prolific in light- to medium-duty engines, though inline-four engines are also common. Small-capacity engines (generally considered to be those below five litres in capacity) are generally four- or six-cylinder types, with the four-cylinder being the most common type found in automotive uses. The V configuration used to be common for commercial vehicles, but it has been abandoned in favour of the inline configuration. Slow-speed engines (< 300 rpm). High-speed engines are used to power trucks (lorries), buses, tractors, cars, yachts, compressors, pumps and small electrical generators. As of 2018, most high-speed engines have direct injection. Many modern engines, particularly in on-highway applications, have common rail direct injection. On bigger ships, high-speed Diesel engines are often used for powering electric generators. The highest power output of high-speed Diesel engines is approximately 5 MW. Medium-speed engines are used in large electrical generators, ship propulsion and mechanical drive applications such as large compressors or pumps. Medium speed Diesel engines operate on either Diesel fuel or heavy fuel oil by direct injection in the same manner as low-speed engines. Usually, they are four-stroke engines with trunk pistons. The power output of medium-speed Diesel engines can be as high as 21,870 kW, with the effective efficiency being around 47...48 % (1982). Most larger medium-speed engines are started with compressed air direct on pistons, using an air distributor, as opposed to a pneumatic starting motor acting on the flywheel, which tends to be used for smaller engines. Medium-speed engines intended for marine applications are usually used to power (ro-ro) ferries, passenger ships or small freight ships. Using medium-speed engines reduces the cost of smaller ships and increases their transport capacity. In addition to that, a single ship can use two smaller engines instead of one big engine, which increases the ship's safety. The MAN B&W 5S50MC 5-cylinder, 2-stroke, low-speed marine Diesel engine. This particular engine is found aboard a 29,000 tonne chemical carrier. Low-speed Diesel engines are usually very large in size and mostly used to power ships. There are two different types of low-speed engines that are commonly used: Two-stroke engines with a crosshead, and four-stroke engines with a regular trunk-piston. 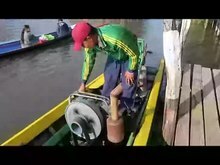 Two-stroke engines have a limited rotational frequency and their charge exchange is more difficult, which means that they are usually bigger than four-stroke engines and used to directly power a ship's propeller. 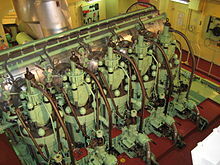 Four-stroke engines on ships are usually used to power an electric generator. An electric motor powers the propeller. Both types are usually very undersquare. Low-speed Diesel engines (as used in ships and other applications where overall engine weight is relatively unimportant) often have an effective efficiency of up to 55 %. Like medium-speed engines, low-speed engines are started with compressed air, and they use heavy oil as their primary fuel. Two-stroke Diesel engines use only two strokes instead of four strokes for a complete engine cycle. Filling the cylinder with air and compressing it takes place in one stroke, and the power and exhaust strokes are combined. The compression in a two-stroke Diesel engine is similar to the compression that takes place in a four-stroke Diesel engine: As the piston passes through bottom centre and starts upward, compression commences, culminating in fuel injection and ignition. Instead of a full set of valves, two-stroke Diesel engines have simple intake ports, and exhaust ports (or exhaust valves). When the piston approaches bottom dead centre, both the intake and the exhaust ports are "open", which means that there is atmospheric pressure inside the cylinder. Therefore, some sort of pump is required to blow the air into the cylinder and the combustion gasses into the exhaust. This process is called scavenging. The pressure required is approximately 10...30 kPa. Crossflow scavenging is incomplete and limits the stroke, yet some manufacturers used it. Reverse flow scavenging is a very simple way of scavenging, and it was popular amongst manufacturers until the early 1980s. Uniflow scavenging is more complicated to make but allows the highest fuel efficiency; since the early 1980s, manufacturers such as MAN and Sulzer have switched to this system. It is standard for modern marine two-stroke Diesel engines. So-called dual-fuel Diesel engines or gas Diesel engines burn two different types of fuel simultaneously, for instance, a gaseous fuel and Diesel engine fuel. The Diesel engine fuel auto-ignites due to compression ignition, and then ignites the gaseous fuel. Such engines do not require any type of spark ignition and operate similar to regular Diesel engines. This means, that increasing either torque or time will result in an increase in power. As the maximum rotational frequency of the Diesel engine's crankshaft is usually in between 3500...5000 min−1 due to Diesel principle limitations, the torque of the Diesel engine must be great to achieve a high power, or, in other words, as the Diesel engine cannot use a lot of time for achieving a certain amount of power, it has to perform more work (=produce more torque). The average Diesel engine has a poorer power-to-mass ratio than the Otto engine. This is because the Diesel must operate at lower engine speeds. Due to the higher operating pressure inside the combustion chamber, which increases the forces on the parts due to inertial forces, the Diesel engine needs heavier, stronger parts capable of resisting these forces, which results in an overall greater engine mass. The distinctive noise of a Diesel engine is variably called Diesel clatter, Diesel nailing, or Diesel knock.Diesel clatter is caused largely by the way the fuel ignites; the sudden ignition of the Diesel fuel when injected into the combustion chamber causes a pressure wave, resulting in an audible ″knock″. Engine designers can reduce Diesel clatter through: indirect injection; pilot or pre-injection; injection timing; injection rate; compression ratio; turbo boost; and exhaust gas recirculation (EGR). Common rail Diesel injection systems permit multiple injection events as an aid to noise reduction. Therefore, newer Diesel engines do not knock anymore. Diesel fuels with a higher cetane rating are more likely to ignite and hence reduce Diesel clatter. In general, Diesel engines do not require any starting aid. In cold weather however, some Diesel engines can be difficult to start and may need preheating depending on the combustion chamber design. The minimum starting temperature that allows starting without pre-heating is 40 °C for precombustion chamber engines, 20 °C for swirl chamber engines, and 0 °C for direct injected engines. Smaller engines with a displacement of less than 1 litre per cylinder usually have glowplugs, whilst larger heavy-duty engines have flame-start systems. In the past, a wider variety of cold-start methods were used. 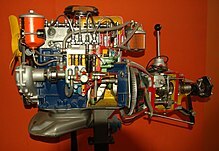 Some engines, such as Detroit Diesel engines used[when?] a system to introduce small amounts of ether into the inlet manifold to start combustion. Instead of glowplugs, some Diesel engines are equipped with starting aid systems that change valve timing. The simplest way this can be done is with a decompression lever. Activating the decompression lever locks the outlet valves in a slight down position, resulting in the engine not having any compression and thus allowing for turning the crankshaft over without resistance. When the crankshaft reaches a higher speed, flipping the decompression lever back into its normal position will abruptly re-activate the outlet valves, resulting in compression − the flywheel's mass moment of inertia then starts the engine. Other Diesel engines, such as the precombustion chamber engine XII Jv 170/240 made by Ganz & Co., have a valve timing changing system that is operated by adjusting the inlet valve camshaft, moving it into a slight "late" position. This will make the inlet valves open with a delay, forcing the inlet air to heat up when entering the combustion chamber. ). Diesel engines are thus ideally suited for supercharging and turbocharging. An additional advantage of the Diesel engine is the lack of fuel during the compression stroke. In Diesel engines, the fuel is injected near top dead centre (TDC), when the piston is near its highest position. The fuel then ignites due to compression heat. Preignition, caused by the artificial turbocharger compression increase during the compression stroke, cannot occur. Many Diesels are therefore turbocharged and some are both turbocharged and supercharged. A turbocharged engine can produce more power than a naturally aspirated engine of the same configuration. A supercharger is powered mechanically by the engine's crankshaft, while a turbocharger is powered by the engine exhaust. Turbocharging can improve the fuel economy of Diesel engines by recovering waste heat from the exhaust, increasing the excess air factor, and increasing the ratio of engine output to friction losses. Adding an intercooler to a turbocharged engine further increases engine performance by cooling down the air-mass and thus allowing more air-mass per volume. A two-stroke engine does not have a discrete exhaust and intake stroke and thus is incapable of self-aspiration. Therefore, all two-stroke Diesel engines must be fitted with a blower or some form of compressor to charge the cylinders with air and assist in dispersing exhaust gases, a process referred to as scavenging. Roots-type superchargers were used for ship engines until the mid-1950s, since 1955 they have been widely replaced by turbochargers. Usually, a two-stroke ship Diesel engine has a single-stage turbocharger with a turbine that has an axial inflow and a radial outflow. In Diesel engines, a mechanical injector system vaporises the fuel directly into the combustion chamber (as opposed to a Venturi jet in a carburetor, or a fuel injector in a manifold injection system vaporising fuel into the intake manifold or intake runners as in a petrol engine). This forced vaporisation means that less-volatile fuels can be used. More crucially, because only air is inducted into the cylinder in a Diesel engine, the compression ratio can be much higher as there is no risk of pre-ignition provided the injection process is accurately timed. This means that cylinder temperatures are much higher in a Diesel engine than a petrol engine, allowing less volatile fuels to be used. Therefore, Diesel engines can operate on a huge variety of different fuels. In general, fuel for Diesel engines should have a proper viscosity, so that the injection pump can pump the fuel to the injection nozzles without causing damage to itself or corrosion of the fuel line. At injection, the fuel should form a good fuel spray, and it should not have a coking effect upon the injection nozzles. To ensure proper engine starting and smooth operation, the fuel should be willing to ignite and hence not cause a high ignition delay, (this means that the fuel should have a high cetane number). Diesel fuel should also have a high lower heating value. Inline mechanical injector pumps generally tolerate poor-quality or bio-fuels better than distributor-type pumps. Also, indirect injection engines generally run more satisfactorily on fuels with a high ignition delay (for instance, petrol) than direct injection engines. This is partly because an indirect injection engine has a much greater 'swirl' effect, improving vaporisation and combustion of fuel, and because (in the case of vegetable oil-type fuels) lipid depositions can condense on the cylinder walls of a direct-injection engine if combustion temperatures are too low (such as starting the engine from cold). Direct-injected engines with an MAN centre sphere combustion chamber rely on fuel condensing on the combustion chamber walls. The fuel starts vaporising only after ignition sets in, and it burns relatively smoothly. Therefore, such engines also tolerate fuels with poor ignition delay characteristics, and, in general, they can operate on petrol rated 86 RON. In his 1893 work Theory and Construction of a Rational Heat Motor, Rudolf Diesel considers using coal dust as fuel for the Diesel engine. However, Diesel just considered using coal dust (as well as liquid fuels and gas); his actual engine was designed to operate on petroleum, which was soon replaced with regular petrol and kerosine for further testing purposes, as petroleum proved to be too viscous. In addition to kerosine and petrol, Diesel's engine could also operate on ligroin. The first Diesel fuel standards were the DIN 51601, VTL 9140-001, and NATO F 54, which appeared after World War II. The modern European EN 590 Diesel fuel standard was established in May 1993; the modern version of the NATO F 54 standard is mostly identical with it. The DIN 51628 biodiesel standard was rendered obsolete by the 2009 version of the EN 590; FAME biodiesel conforms to the EN 14214 standard. Watercraft Diesel engines usually operate on Diesel engine fuel that conforms to the ISO 8217 standard (Bunker C). Also, some Diesel engines can operate on gasses (such as LNG). DIN 51601 Diesel fuel was prone to waxing or gelling in cold weather; both are terms for the solidification of Diesel oil into a partially crystalline state. The crystals build up in the fuel system (especially in fuel filters), eventually starving the engine of fuel and causing it to stop running. Low-output electric heaters in fuel tanks and around fuel lines were used to solve this problem. Also, most engines have a spill return system, by which any excess fuel from the injector pump and injectors is returned to the fuel tank. Once the engine has warmed, returning warm fuel prevents waxing in the tank. Some manufacturers, such as BMW, recommended fuelling Diesel cars with petrol to prevent the fuel from gelling when the temperatures dropped below −15 °C. Diesel fuel is less flammable than petrol, because its flash point is 55 °C, leading to a lower risk of fire caused by fuel in a vehicle equipped with a Diesel engine. Diesel fuel can create an explosive air/vapour mix under the right conditions. However, compared with petrol, it is less prone due to its lower vapour pressure, which is an indication of evaporation rate. The Material Safety Data Sheet for ultra-low sulfur Diesel fuel indicates a vapour explosion hazard for Diesel fuel indoors, outdoors, or in sewers. Diesel exhaust has been classified as an IARC Group 1 carcinogen. It causes lung cancer and is associated with an increased risk for bladder cancer. The characteristics of Diesel have different advantages for different applications. Diesel engines have long been popular in bigger cars and have been used in smaller cars such as superminis in Europe since the 1980s. They were popular in larger cars earlier, as the weight and cost penalties were less noticeable. Smooth operation as well as high low end torque are deemed important for passenger cars and small commercial vehicles. The introduction of electronically controlled fuel injection significantly improved the smooth torque generation, and starting in the early 1990s, car manufacturers began offering their high-end luxury vehicles with Diesel engines. Passenger car Diesel engines usually have between three and ten cylinders, and a displacement ranging from 0.8 to 5.0 litres. Modern powerplants are usually turbocharged and have direct injection. Diesel engines do not suffer from intake-air throttling, resulting in very low fuel consumption especially at low partial load (for instance: driving at city speeds). One fifth of all passenger cars worldwide have Diesel engines, with many of them being in Europe, where approximately 47 % of all passenger cars are Diesel-powered. Daimler-Benz in conjunction with Robert Bosch GmbH produced Diesel-powered passenger cars starting in 1936. The popularity of Diesel-powered passenger cars in markets such as India, South Korea and Japan is increasing (as of 2018). In 1893, Rudolf Diesel suggested that the Diesel engine could possibly power „wagons“ (lorries). The first lorries with Diesel engines were brought to market in 1924. Modern Diesel engines for lorries have to be both extremely reliable and very fuel efficient. Common-Rail direct injection, turbocharging and four valves per cylinder are standard. The displacements are ranging from 4.5 to 15.5 litres, with power-to-mass ratios of 2.5...3.5 kg·kW−1 for heavy duty and 2.0...3.0 kg·kW−1 for medium duty engines. Manufacturers used to design V6 and V8 engines in the past, due to the relatively low engine mass the V configuration provides. Recently, the V configuration has been abandoned in favour of straight engines. These engines are usually straight-6 for heavy and medium duties and straight-4 for medium duty. Their undersquare design causes lower overall piston speeds which results in increased lifespan of up to 1,200,000 km. Compared with 1970s Diesel engines, the expected lifespan of modern lorry Diesel engines has more than doubled. Diesel engines for locomotives are built for continuous operation and may require the ability to use poor quality fuel in some circumstances. Some locomotives use two-stroke Diesel engines. Diesel engines have eclipsed steam engines as the prime mover on all non-electrified railroads in the industrialised world. The first Diesel locomotives appeared in 1913, and Diesel multiple units soon after. Many modern Diesel locomotives are actually Diesel-electric locomotives: the Diesel engine is used to power an electric generator that in turn powers electric traction motors with no mechanical connection between Diesel engine and traction. While electric locomotives have replaced the Diesel locomotive for some passenger traffic in Europe and Asia, Diesel is still today very popular for cargo-hauling freight trains and on tracks where electrification is not feasible. In the 1940s, road vehicle Diesel engines with power outputs of 150...200 PS (110...147 kW) were considered reasonable for DMUs. Commonly, regular truck powerplants were used. The height of these engines had to be less than 1,000 mm to allow underfloor installation. Usually, the engine was mated with a pneumatically operated mechanical gearbox, due to the low size, mass, and production costs of this design. Some DMUs used hydraulic torque converters instead. Diesel-electric transmission was not suitable for such small engines. In the 1930s, the Deutsche Reichsbahn standardised its first DMU engine. It was a 30.3 litre, 12-cylinder boxer unit, producing 275 PS (202 kW). Several German manufacturers produced engines according to this standard. The requirements for marine Diesel engines vary, depending on the application. For military use and medium-size boats, medium-speed four-stroke Diesel engines are most suitable. These engines usually have up to 24 cylinders and come with power outputs in the one-digit Megawatt region. Small boats may use lorry Diesel engines. Large ships use extremely efficient, low-speed two-stroke Diesel engines. They can reach efficiencies of up to 55 %. Unlike most regular Diesel engines, two-stroke watercraft engines use highly viscous fuel oil. Submarines are usually Diesel-electric. The first Diesel engines for ships were made by A. B. Diesels Motorer Stockholm in 1903. These engines were three-cylinder units of 120 PS (88 kW) and four-cylinder units of 180 PS (132 kW) and used for Russian ships. In World War I, especially submarine Diesel engine development advanced quickly. By the end of the War, double acting piston two-stroke engines with up to 12,200 PS (9 MW) had been made for marine use. Non-road Diesel engines are commonly used for construction equipment. Fuel efficiency, reliability and ease of maintenance are very important for such engines, whilst high power output and quite operation are negligible. Therefore, mechanically controlled fuel injection and air-cooling are still very common. The common power outputs of non-road Diesel engines vary a lot, with the smallest units starting at 3 kW, and the most powerful engines being heavy duty lorry engines. Stationary Diesel engines are commonly used for electricity generation, but also for powering refrigerator compressors, or other types of compressors or pumps. Usually, these engines run permanently, either with mostly partial load, or intermittently, with full load. Stationary Diesel engines powering electric generators that put out an alternating current, usually operate with alternating load, but fixed rotational frequency. This is due to the mains' fixed frequency of either 50 Hz (Europe), or 60 Hz (United States). The engine's crankshaft rotational frequency is chosen so that the mains' frequency is a multiple of it. For practical reasons, this results in crankshaft rotational frequencies of either 25 Hz (1500 per minute) or 30 Hz (1800 per minute). A special class of prototype internal combustion piston engines has been developed over several decades with the goal of improving efficiency by reducing heat loss. These engines are variously called adiabatic engines; due to better approximation of adiabatic expansion; low heat rejection engines, or high temperature engines. They are generally piston engines with combustion chamber parts lined with ceramic thermal barrier coatings. Some make use of pistons and other parts made of titanium which has a low thermal conductivity and density. Some designs are able to eliminate the use of a cooling system and associated parasitic losses altogether. Developing lubricants able to withstand the higher temperatures involved has been a major barrier to commercialization. In mid-2010s literature, main development goals for future Diesel engines are described as improvements of exhaust emissions, reduction of fuel consumption, and increase of lifespan (2014). It is said that the Diesel engine, especially the Diesel engine for commercial vehicles, will remain the most important vehicle powerplant until the mid-2030s. Editors assume that the complexity of the Diesel engine will increase further (2014). Some editors expect a future convergency of Diesel and Otto engines' operating principles due to Otto engine development steps made towards homogeneous charge compression ignition (2017). ^ "Patent Images". Pdfpiw.uspto.gov. Retrieved October 28, 2017. ^ Diesel, Rudolf (October 28, 1897). "Diesel's Rational Heat Motor: A Lecture". Progressive Age Publishing Company. Retrieved October 28, 2017. ^ ‹See Tfd›ES 16654 "Perfeccionamientos en los motores de combustión interior." ^ Moon, John F. (1974). Rudolf Diesel and the Diesel Engine. London: Priory Press. ISBN 978-0-85078-130-4. ^ Diesel, Rudolf (August 23, 1894). Theory and Construction of a Rational Heat Motor. E. & F. N. Spon. ^ Rudolf Diesel: Theorie und Konstruktion eines rationellen Wärmemotors zum Ersatz der Dampfmaschine und der heute bekannten Verbrennungsmotoren, Springer, Berlin 1893, ISBN 978-3-642-64949-3. ^ ‹See Tfd›DE 82168 "Verbrennungskraftmaschine mit veränderlicher Dauer der unter wechselndem Überdruck stattfindenden Brennstoffeinführung"
^ The Diesel engine. 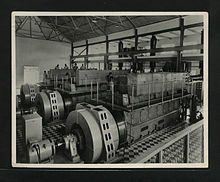 Busch–Sulzer Bros.-Diesel Engine Company, St. Louis Busch. 1913. ^ Spencer C. Tucker (October 28, 2014). World War I: The Definitive Encyclopedia and Document Collection [5 volumes]: The Definitive Encyclopedia and Document Collection. ABC-CLIO. pp. 1506–. ISBN 978-1-85109-965-8. ^ Jeff Hartman. Turbocharging Performance Handbook. MotorBooks International. pp. 2–. ISBN 978-1-61059-231-4. ^ John W. Klooster (2009). Icons of Invention: The Makers of the Modern World from Gutenberg to Gates. ABC-CLIO. pp. 245–. ISBN 978-0-313-34743-6. ^ Rivers and Harbors. 1921. pp. 590–. ^ Brian Solomon. American Diesel Locomotives. Voyageur Press. pp. 34–. ISBN 978-1-61060-605-9. ^ John Pease (2003). The History of J & H McLaren of Leeds: Steam & Diesel Engine Makers. Landmark Pub. ISBN 978-1-84306-105-2. ^ Automobile Quarterly. Automobile Quarterly. 1974. ^ Sean Bennett (January 1, 2016). Medium/Heavy Duty Truck Engines, Fuel & Computerized Management Systems. Cengage Learning. pp. 97–. ISBN 978-1-305-57855-5. ^ International Directory of Company Histories. St. James Press. 1996. ISBN 978-1-55862-327-9. ^ "History of the DLG – Agritechnica's organizer". November 2, 2017. Retrieved February 19, 2019. ^ Pearce, William (September 1, 2012). "Fairbanks Morse Model 32 Stationary Engine". ^ a b Hans Christian Graf von Seherr-Thoß (auth): Die Technik des MAN Nutzfahrzeugbaus, in MAN Nutzfahrzeuge AG (ed. ): Leistung und Weg: Zur Geschichte des MAN Nutzfahrzeugbaus, Springer, Berlin/Heidelberg, 1991. ISBN 978-3-642-93490-2. p. 465. ^ Andrew Roberts (July 10, 2007). "Peugeot 403". The 403, launched half a century ago, established Peugeot as a global brand. The Independent, London. Retrieved February 28, 2019. ^ Carl-Heinz Vogler: Unimog 406 – Typengeschichte und Technik. Geramond, München 2016, ISBN 978-3-86245-576-8. p. 34. ^ Daimler Media : Vorkammer Adieu: Im Jahr 1964 kommen erste Direkteinspritzer bei Lkw und Bus, 12 Februar 2009, retrieved 22 February 2019. ^ US Patent #3,220,392, filed June 4, 1962, granted Nov 30, 1965. ^ "Blauer Rauch". Der VW-Konzern präsentiert seine neuesten Golf-Variante -- den ersten Wolfsburger Personenwagen mit Dieselmotor. Der Spiegel (online). September 27, 1976. Retrieved February 28, 2019. ^ Georg Auer (May 21, 2001). "How Volkswagen built a diesel dynasty". Automotive News Europe. Crain Communications, Inc., Detroit MI. Retrieved February 28, 2019. ^ a b Brian Long: Zero Carbon Car: Green Technology and the Automotive Industry, Crowood, 2013, ISBN 9781847975140. ^ "Perfect piezo". The Engineer. November 6, 2003. Retrieved May 4, 2016. At the recent Frankfurt motor show, Siemens, Bosch and Delphi all launched piezoelectric fuel injection systems. ^ "EPA, California Notify Volkswagen of Clean Air Act Violations / Carmaker allegedly used software that circumvents emissions testing for certain air pollutants". US: EPA. September 18, 2015. Retrieved July 1, 2016. ^ "'It Was Installed For This Purpose,' VW's U.S. CEO Tells Congress About Defeat Device". NPR. October 8, 2015. Retrieved October 19, 2015. ^ "Abgasaffäre: VW-Chef Müller spricht von historischer Krise". Der Spiegel. Reuters. September 28, 2015. Retrieved September 28, 2015. ^ a b c Stefan Pischinger, Ulrich Seiffert (ed. ): Vieweg Handbuch Kraftfahrzeugtechnik. 8th edition, Springer, Wiesbaden 2016. ISBN 978-3-658-09528-4. p. 348. ^ Hemmerlein, Norbert; Korte, Volker; Richter, Herwig; Schröder, Günter (February 1, 1991). "Performance, Exhaust Emissions and Durability of Modern Diesel Engines Running on Rapeseed Oil". SAE Technical Paper Series. 1. doi:10.4271/910848. ^ "Medium and Heavy Duty Diesel Vehicle Modeling Using a Fuel Consumption Methodology" (PDF). US EPA. 2004. Retrieved April 25, 2017. ^ Michael Soimar (April 2000). "The Challenge Of CVTs In Current Heavy-Duty Powertrains". Diesel Progress North American Edition. Archived from the original on December 7, 2008. ^ "NRAO Green Bank Site RFI Regulations for Visitors" (PDF). National Radio Astronomy Observatory. p. 2. Retrieved October 14, 2016. ^ "Diesel injection pumps, Diesel injectors, Diesel fuel pumps, turbochargers, Diesel trucks all at First Diesel Injection LTD". Firstdiesel.com. Archived from the original on November 18, 2010. Retrieved May 11, 2009. ^ "Diesel Fuel Injection—How-It-Works". Diesel Power. June 2007. Retrieved November 24, 2012. ^ Klaus Schreiner: Basiswissen Verbrennungsmotor: Fragen – rechnen – verstehen – bestehen. Springer, Wiesbaden 2014, ISBN 978-3-658-06187-6, p. 22. ^ a b "Combustion in IC (Internal Combustion) Engines". —: Slide 37. Archived from the original on August 16, 2005. Retrieved November 1, 2008. ^ "Engine & fuel engineering—Diesel Noise". Retrieved November 1, 2008. ^ The Free Library  "Detroit Diesel Introduces DDEC Ether Start", March 13, 1995, accessed March 14, 2011. ^ Hans Christian Graf von Seherr-Thoß (auth): Die Technik des MAN Nutzfahrzeugbaus, in MAN Nutzfahrzeuge AG (ed. ): Leistung und Weg: Zur Geschichte des MAN Nutzfahrzeugbaus, Springer, Berlin/Heidelberg, 1991. ISBN 978-3-642-93490-2. pp. 438. ^ a b Hans Christian Graf von Seherr-Thoß (auth): Die Technik des MAN Nutzfahrzeugbaus, in MAN Nutzfahrzeuge AG (ed. ): Leistung und Weg: Zur Geschichte des MAN Nutzfahrzeugbaus, Springer, Berlin/Heidelberg, 1991. ISBN 978-3-642-93490-2. pp. 436. ^ "Microsoft Word—MSDS Low Sulfur Diesel #2.doc" (PDF). Archived (PDF) from the original on November 21, 2010. Retrieved December 21, 2010. ^ "Browse Papers on Adiabatic engines : Topic Results - SAE International". topics.sae.org. Archived from the original on August 23, 2017. Retrieved April 30, 2018. ^ Schwarz, Ernest; Reid, Michael; Bryzik, Walter; Danielson, Eugene (March 1, 1993). "Combustion and Performance Characteristics of a Low Heat Rejection Engine" – via papers.sae.org. ^ Bryzik, Walter; Schwarz, Ernest; Kamo, Roy; Woods, Melvin (March 1, 1993). "Low Heat Rejection From High Output Ceramic Coated Diesel Engine and Its Impact on Future Design" – via papers.sae.org. ^ Danielson, Eugene; Turner, David; Elwart, Joseph; Bryzik, Walter (March 1, 1993). "Thermomechanical Stress Analysis of Novel Low Heat Rejection Cylinder Head Designs" – via papers.sae.org. ^ Nanlin, Zhang; Shengyuan, Zhong; Jingtu, Feng; Jinwen, Cai; Qinan, Pu; Yuan, Fan (March 1, 1993). "Development of Model 6105 Adiabatic Engine" – via papers.sae.org. ^ Kamo, Lloyd; Kleyman, Ardy; Bryzik, Walter; Schwarz, Ernest (February 1, 1995). "Recent Development of Tribological Coatings for High Temperature Engines" – via papers.sae.org. 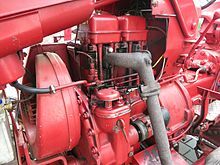 Wikimedia Commons has media related to Diesel engines. Wikimedia Commons has media related to Rudolf Diesel. Wikisource has the text of the 1921 Collier's Encyclopedia article Diesel Engine. "Diesel Information Hub". Association for Emissions Control by Catalyst .